Franchising in India is predominantly present in Education Sector, however as a business format, is prevalent in various sectors like Food &amp; Beverage, Hotel Chains, Automobile, Medical &amp; Pharmacy, Textile, Manufacturing and others. Franchising is generally identified by the format of agreement ‘as such’ entered into, and other covenants like Franchise Fee, License Fee, Royalty, and Revenue Share. Person who holds right over specific brand name / trade mark and grants the right to use it to others is called ‘Franchisor’ and other person thus taking the rights to use such brand name, trade mark or process is called ‘Franchisee’. From the moment a prospective franchisee gets into contact with the respective franchisor, a vicious cycle of misrepresentation and fraud is started, which ends with the unknown and known sufferings of end consumer of such educational products. Marketing Brochure is the main selling tool used by Franchisors, which generally contains exaggerated numbers, hideous truths, fictional narratives, all presented in ‘sugar coated’ format. Investor having heavily invested into such offerings sees no way out for themselves. 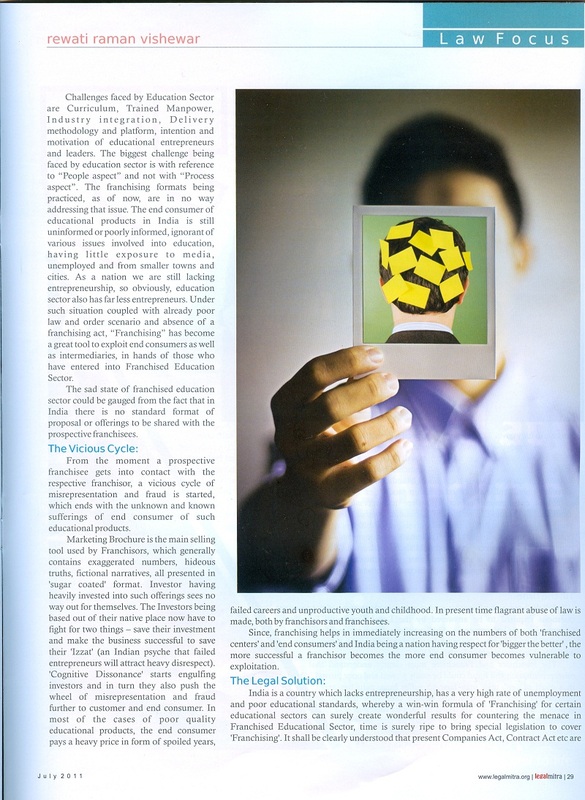 Investors being based out of their native place now have to fight for two things – save their investment and make the business successful to save their ‘Izzat’ (an Indian psyche that failed entrepreneurs will attract heavy disrespect).’Cognitive Dissonance’ starts engulfing investors and in turn they also push the wheel of misrepresentation and fraud further to customer and end consumer. In most of the cases of, poor quality educational products, the end consumer pays a heavy price in form of spoiled years, failed careers and unproductive youth and childhood. In present time flagrant abuse of law is made, both by franchisors and franchisees. Since, franchising helps in immediately increasing on the numbers of both ‘franchised centers’ and ‘end consumers’ and India being a nation having respect for ‘bigger the better’ , the more successful a franchisor becomes the more end consumer becomes vulnerable to exploitation. To begin with, standard format of Proposal, Offerings and presentation should be drafted by Legal drafters, which shall be followed by all Franchisors. Both, rights and obligations of Franchisors and Franchisees are to be clearly mentioned. It shall be required that franchisee agreement shall enlist all the relationship modalities. Legal drafters should understand that a successful entrepreneur is not equivalent to successful franchisor, and so criteria of ‘franchisability’ must be mentioned. Legislation must also include the minimum number of years of agreement to be entered into with respect to different education sector and renewal criteria. Although we already have Trademark and copyrights Act, but Trade mark usage, copyrights and process copyrights should also be addressed. What shall happen in case of operational failures of either franchisor or franchisee should also be included. It shall be a compulsion to include each discussion between franchisor and franchisee in writing. 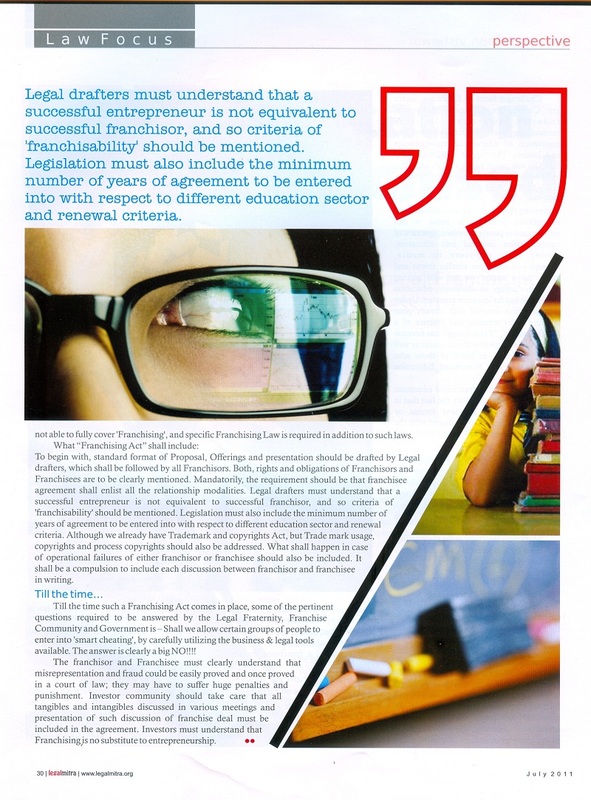 Till the time such Franchising Act comes in place, some of the pertinent questions required to be answered by the Legal Fraternity, Franchise Community and Government is – Shall we allow certain group of people to enter into ‘smart cheating’, by carefully utilizing the business &amp; legal tools available. The answer is clearly a big NO. Franchisor and Franchisee must clearly understand that misrepresentation and fraud could be easily proved and once proved in court of law. They may have to suffer huge penalties and punishment. Investor community should take care that all tangibles and intangibles discussed in various meetings and presentation of such discussion of franchise deal must be included in the agreement. Investors must understand that Franchising is no substitute to entrepreneurship. Writer Rewati Raman Vishewar is a Business Consultant to Education Industry.